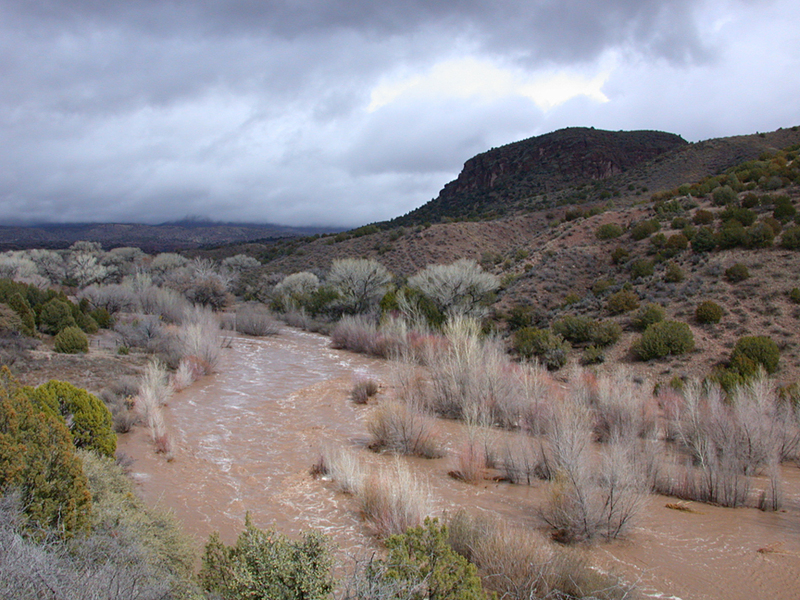 View of February 12, 2005 Flood at near peak flow, looking north from Casitas towards Turtle Rock. 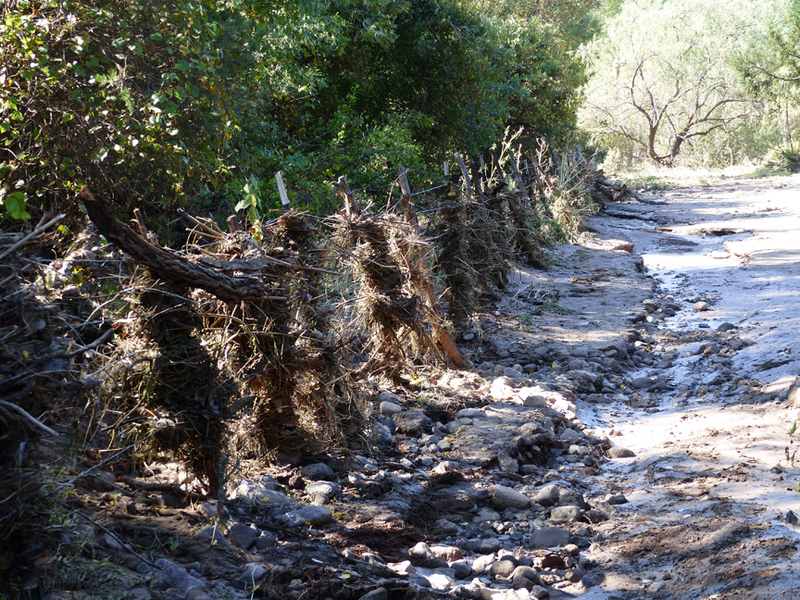 Photo illustrates how major floods will inundate the entire Bear Creek floodplain and lower stream bank terraces. Because the September 22, 2014 Flood peaked and receded before dawn there are no comparable photos. 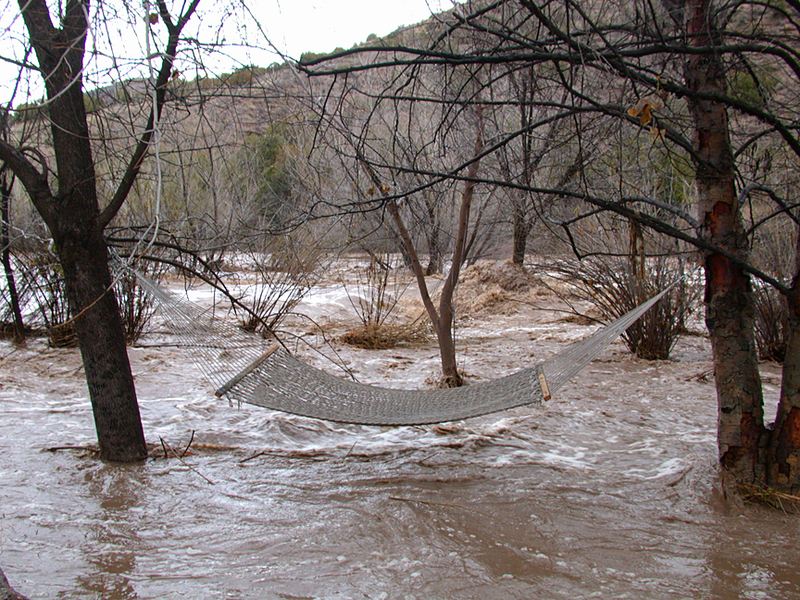 Hammock below Casitas at peak flow of February 12, 2005 flood. Water level at this time approximately 8 feet above normal water level of Bear Creek. Debris left behind in trees near the hammock by the September 22, 2014 flood showed that this same hammock was two feet under water in the 2014 Flood, or between 10 and 12 feet above normal water level! On Sunday night, September 14, 2014, Hurricane Odile came ashore on Mexico’s Baja California Peninsula, making a direct hit on the resort tourist destination of Cabo San Lucas as a Category 3 hurricane with sustained winds of 125 mph. It was the strongest hurricane to hit the Peninsula in recorded history. After inflicting devastating damage and chaos in Cabo, the hurricane took an unusual northward path along the Baja Peninsula towards Arizona, reaching the U.S. border on Friday, September 19. Passing into Arizona, the storm then took a turn to the east towards Southern New Mexico and West Texas. Although the winds rapidly decreased upon entering the U.S., the degraded storm succeeded in dragging a huge plume of moisture into the Southwest, triggering several days of rain and thunderstorms as it travelled eastward, and resulting in extreme flooding and flash floods in SE Arizona and SW New Mexico. The National Weather Service (NWS) had predicted that over the weekend and early into the coming week of September 22 there would be a high probability of showers and thunderstorms, with some local flooding and flash floods as the remnants of Storm Odile made its way from Arizona east towards Texas. Indeed, on September 20 and 21, patchy showers, thunderstorms and localized flooding occurred throughout Southwest New Mexico, although only small amounts of rain and only a brief, small rise in Bear Creek were recorded at the Casitas. 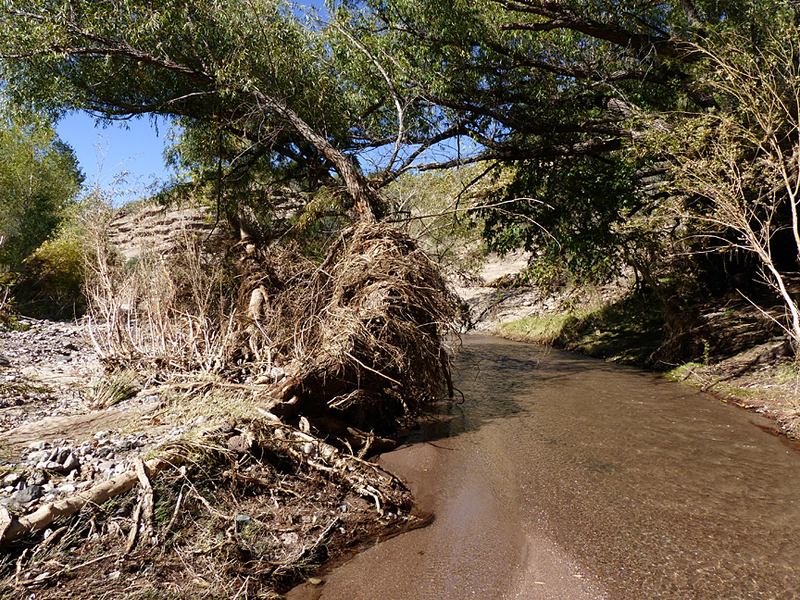 By Sunday evening, September 21, NWS radar was showing that the most intense thunderstorm activity stemming from the rapidly-dissipating Odiel had now moved east of the Casitas and the surrounding Gila area towards Truth or Consequences, NM, suggesting that the potential for significant flooding was over. Such was not the case. At about 2 AM on Monday morning, September 22, the first of several large thunderstorms made a direct hit on the Casitas. With the pounding of the first blast of rain on the roof, a check with the NWS radar showed that the thunderstorm cell had come out of the Northeast. With increasing consternation, it was quickly determined that not only was it a large cell, but there were several large cells lined up behind it, all of which were tracking straight towards the Casitas. Taken together, the numerous cells covered a wide swath that essentially covered the entire drainage basin of Bear Creek, extending all the way upstream from the Casitas to Pinos Altos, 25 miles to the northeast. If these cells remained active for any length of time, it was pretty certain that Bear Creek was going to flood. Judging by the persisting deep red to purple colors of the cells on the radar as they slowly moved down Bear Creek, it was going to be a major flood. All of the thunderstorm cells remained intensely active until 4 AM, when the last of them finally passed over the Casitas. 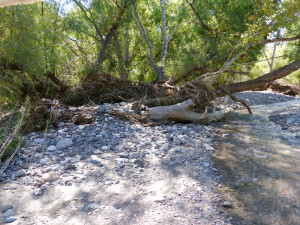 By this time Bear Creek was already roaring unseen in the darkness 100 feet below in the canyon below the Casitas. By the sound of it, a significant flash flood was underway, but it would be another two and a half hours before the first light of day would illuminate the magnitude of what was actually taking place. Peering down into the canyon in the early morning light, one could see that the peak of the resulting flash flood had already passed by and that Bear Creek was still swollen out of its banks and running strong. Here and there chaotic masses of vegetative debris could be seen hanging high in the branches of the cottonwoods and willows several feet above the floodwaters that still ran across the entire floodplain and onto the adjacent stream terraces below. Over the main channel an endless parade of logs, branches, and mats of other floating debris shot by in the churning waters. Late in the day on Monday, when the Creek had dropped substantially from its highest stand, some guests staying at the Casitas ventured down to take a closer look at the still roaring Bear Creek, following a trail that leads down to a hammock that is situated on a creek bank terrace about 6 feet above the main channel, on the Casita side of the Creek. Upon their return they estimated that the hammock (still intact and hanging on its chains) had been submerged about 2 feet underwater at the peak of the flood on the basis of debris caught in adjacent trees, which would put the maximum depth of the Creek over the channel at about 10 feet. If verified, this figure would mean that the September 22 floodwaters had attained the greatest depth of any flood experienced in the 16-year history of Casitas de Gila Guesthouses, the previous record being an 8-foot depth from the February 12, 2005 flood. 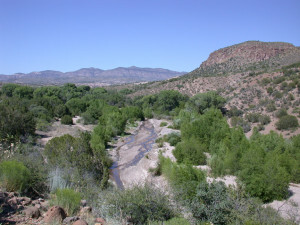 That flood had resulted when a warm front coming up from Mexico brought 2.5 inches of slow rain to the area over a 52-hour period, which succeeded in melting all of the snow pack in the high mountains of the Gila Wilderness lying a few miles north and northeast from the Casitas. It would be three days before the floodwaters receded to the main channel and the velocity dropped enough that one could cross the creek safely to survey and record what had taken place. 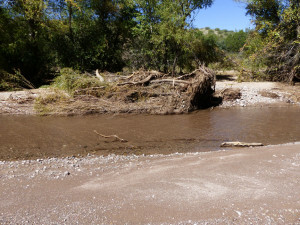 Starting at the downstream boundary of the Casita land and following the course of the Creek two-thirds of a mile to the upstream Casita boundary, a close inspection revealed that the guest’s estimate was actually conservative in that the floodwaters had in places reached depths of 11 to 12 feet, based on debris lodged in the trees bordering the main channel. 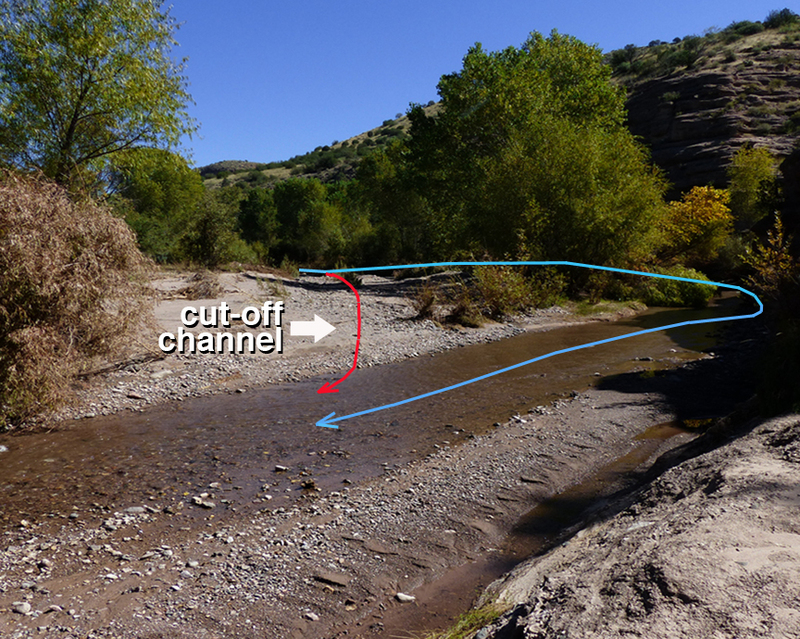 Before illustrating and discussing the changes that took place on Bear Creek over the three-day period of September 22-25, 2014, it is useful to review some of the basic processes that affect how a stream evolves and changes over time. Looking upstream, photo illustrates formation of slip-off slope and point bar on east side of main channel and cut-bank on west side of channel, following drop of flood waters to normal flow. Photo illustrating cut-off channel scoured by flood waters abandoning curve in main channel (flowing from upper left of photo out of sight behind trees to right side of photo and then to lower left of photo) to flow directly across floodplain. 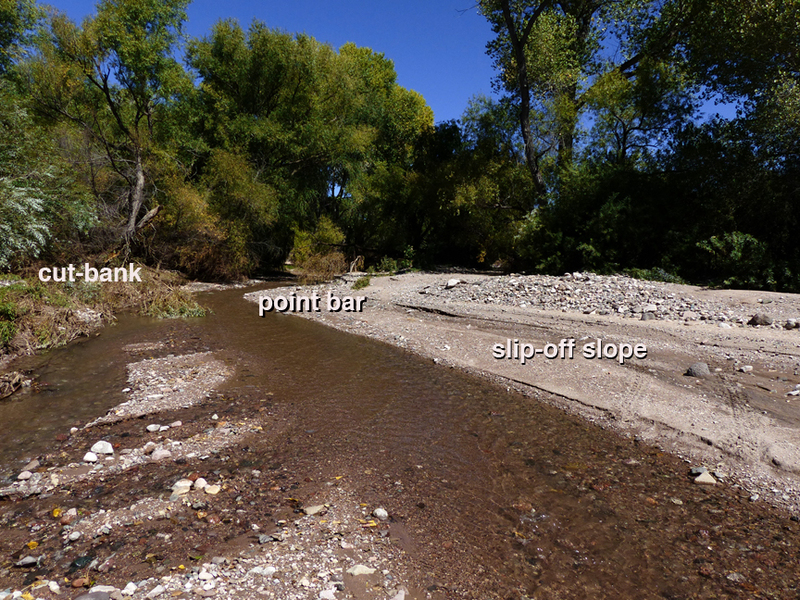 All streams, from small creeks to large rivers, are typically in a state of dynamic flux, attempting to achieve a state of equilibrium where there is neither erosion nor deposition of stream load along the stream channel. Such equilibrium is only rarely and briefly achieved as fluctuation in the volume and velocity of water, plus the gradient or slope of the channels, vary constantly. During floods and flash floods such fluctuations increase exponentially, both in magnitude as well as spatially, as flood waters leave their channels and flow out across the floodplain, and, in the case of large floods, ultimately submerge the adjacent river bank terraces. 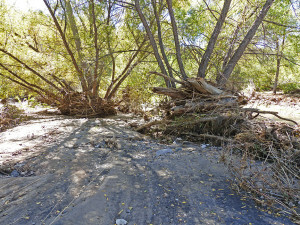 When the floodplain is covered with riverine forest, as is the case of Bear Creek in front of the Casitas, the resulting fluctuations are extremely chaotic as trees are undercut and topple or masses of floating debris of logs and vegetative matter lodge against standing trees forming localized dams to the churning waters. Vegetative debris caught on willow tree at edge of main channel. Scarred bark just above debris (probably result of hit by floating log) is about 12 feet above main channel normal water level. Debris caught on 4-1/2 foot Casita horse corral fence. Flood-scoured corral is located on top of first stream bank terrace approximately 7 feet above normal water level in main channel. In terms of duration, the 2005 flood went on relatively unabated for nearly two weeks because of a warm front that came up from Mexico dropping 2.5 inches of widespread rain over a period of 52 hours that covered not only the entire Bear Creek drainage system, but also melted all of the snowpack in the adjacent mountains. In contrast, the 2014 flood was essentially a flash flood resulting from only a few hours of intense thunderstorms having extreme precipitation rates of 1 to 2 inches per hour that were confined to the center of the Bear Creek drainage basin. So while the 2014 flood reached greater depths, much greater volumes per second, and higher velocities, this greater intensity only lasted a few hours in comparison to the less intense, but much longer lasting 2005 flood. Surface of stream bank terrace 6 feet above main channel cut away by erosion and scoured to depths of three feet or more by flood waters. 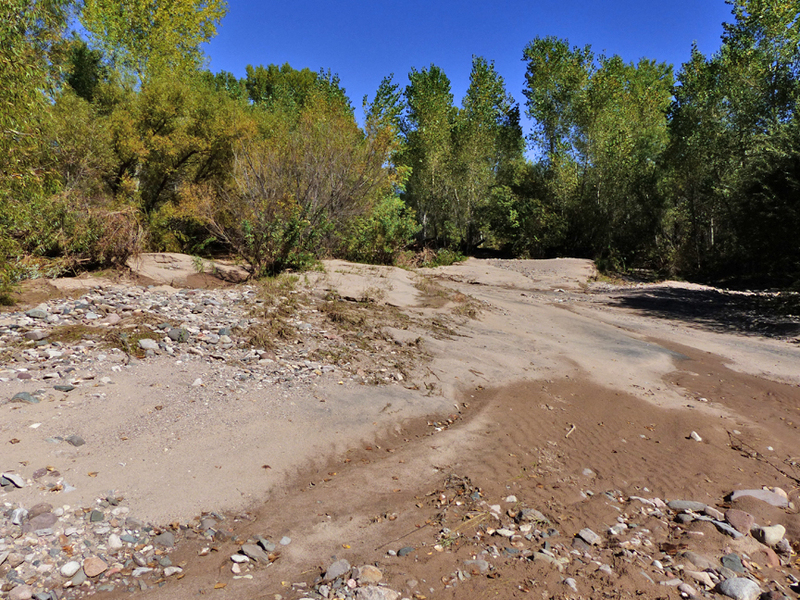 Looking upstream on floodplain at thick deposits of sand deposited downstream from the dense stand of cottonwood and willow in background which slowed water flowing across floodplain sufficiently so that suspended load of sand sediment would be deposited. 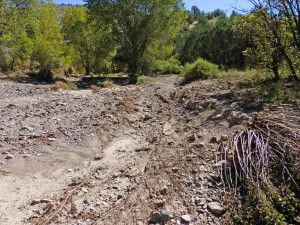 Looking upstream on floodplain where debris dams on right side of photo have concentrated waters flood waters on floodplain to selectively scoured away all fine silt and sand to leave a cut-off channel paved with course cobbles and boulders. 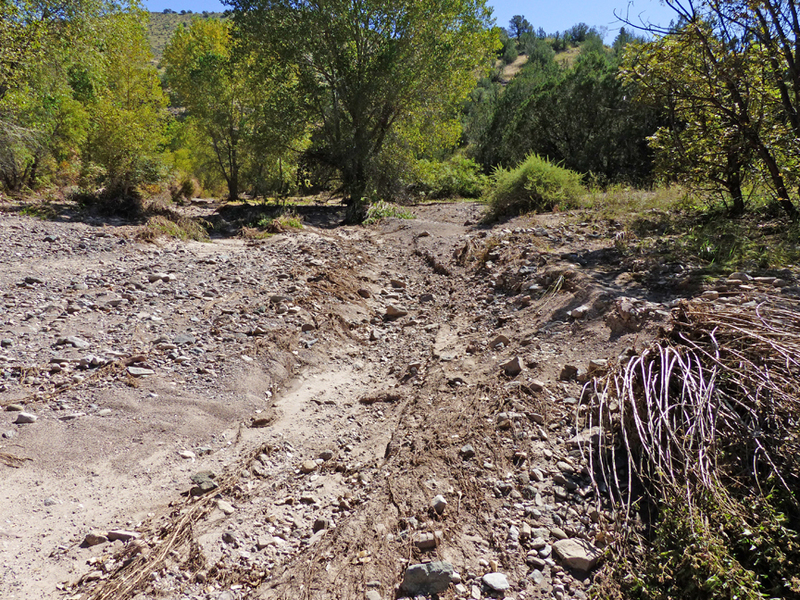 Consequently, the change affected by these two floods upon Bear Creek Canyon was quite different. These changes can be summed up as large scale but gradual changes affected by the 2005 flood as opposed to small scale but catastrophic changes for the 2014 flood. 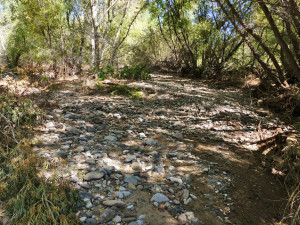 For example: in the 2005 flood the main channel of Bear Creek was shifted from the eastern edge of the canyon some 200 feet to the west to where it is now located directly below the Casitas on the western edge of the canyon. 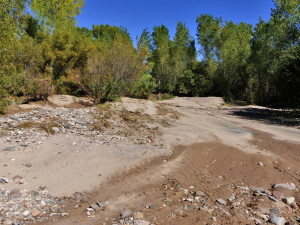 By contrast, the 2014 flood produced numerous, but localized, deeply scoured channels and thick, irregular mound-shaped deposits of sand to coarse gravel and boulders across the floodplain, as well as uprooting trees and stripping vegetation from bedrock surfaces. Clump of several 20-foot willow trees that were growing on stream bank on west side of main channel that were undercut and toppled by flood. Mass of upstream-facing roots will act as a dam-like barrier to prevent further erosion of the Creek bank at this spot and cause migration of the main channel to the east (toward the camera). 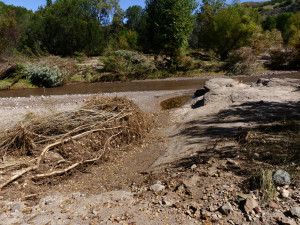 Gila Conglomerate bedrock exposed on south side of main channel when flood waters stripped away the cover of creek bank vegetation shown on left side of photo. 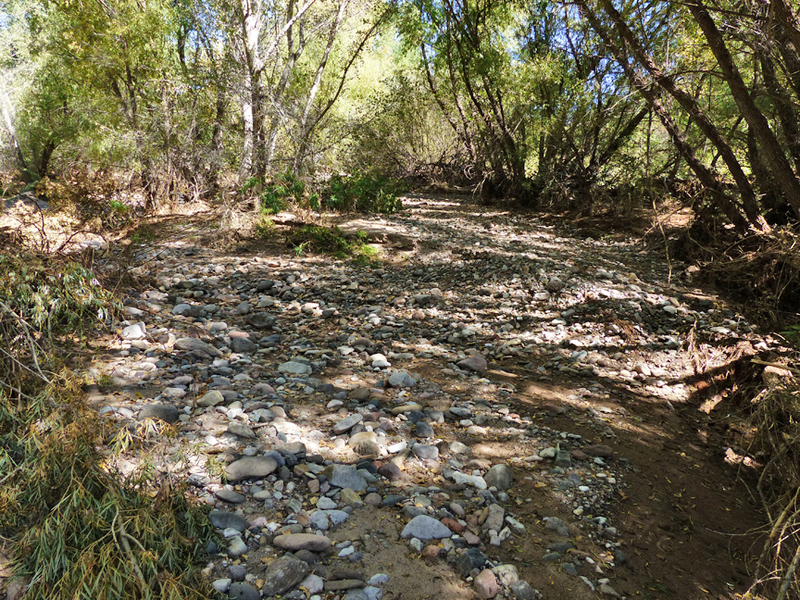 Thus exposed, bed-load sand and gravel carried by future floods will now resume the wearing down of the bedrock surface continuing the eternal downcutting of Bear Creek Canyon. Another critical factor responsible for the vast difference in affects resulting from the 2005 and 2014 flood is the dramatic increase in floodplain vegetation between June 2005 and September 20, 2014 (just two days before the flood) as illustrated in the these photos. View of Bear Creek floodplain looking north upstream towards Turtle Rock on June 18, 2005. Note width of channel and and paucity of floodplain vegetation when compared to 2014 photo on right. View of Bear Creek floodplain looking upstream towards Turtle Rock on September 20, 2014, two days before the Great Flash Flood. Note narrow width of main channel and extensive development of riverine forest across the floodplain on east side of Creek (right side of photo) in comparison to 2005 photo on left. In addition to the increase in density of the maturing riparian forest over the floodplain, note how the main channel in 2014 has become constricted in width, resulting in both active down cutting of the main channel itself while simultaneously forcing a high volume of rapidly-moving water out across the floodplain. The result of these high-energy flood waters surging across the densely-forested floodplain produced massive change across the floodplain in terms of the erosion and scouring of new cut-off channels, plus large-scale build-up of adjacent stream bank terraces of both fine and course suspended and bed load material in response to localized damming effects of flood-transported debris being caught against trees on the floodplain which resulted a reduction in the velocity of the water resulting in deposition of stream load. Localized debris dams slow water movement over floodplain causing deposition and buildup of fine suspended load sediment. 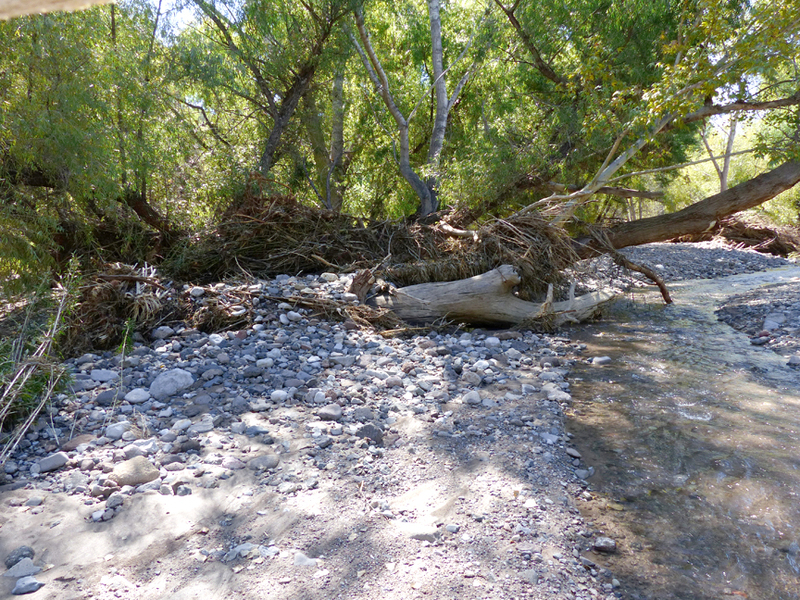 Localized debris dam on floodplain causing deposition and buildup of coarse gravel and boulders. 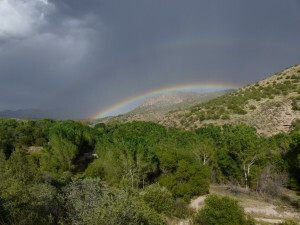 This entry was posted in Bear Creek, monsoon rains, weather and tagged Bear Creek, flash flood. Bookmark the permalink.